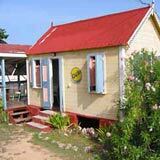 Over the years, Meads Bay has become a Caribbean dining destination. 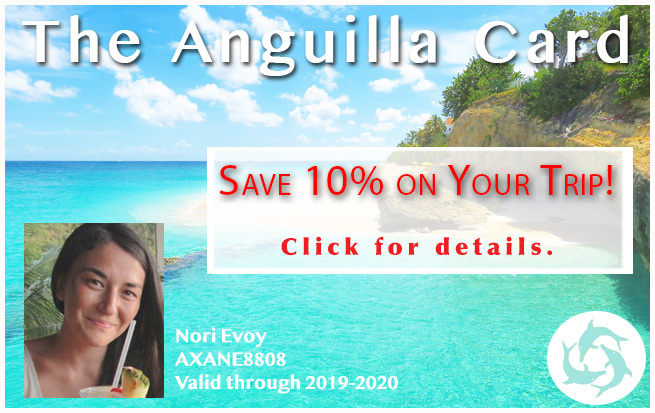 The beach is known for its wide collection of top tier beachfront restaurants that attract the most discerning travelers and gourmands. 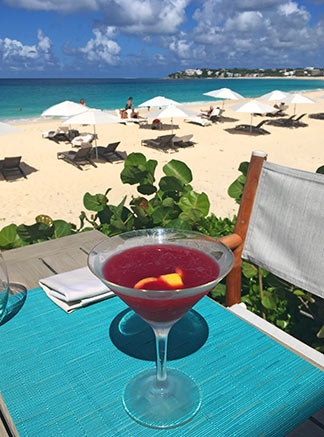 Set over sparkling-white sands that give way to dazzling diamond-like seas, Bamboo Bar & Grill has long been a favorite for crisp cocktails and long, leisurely lunches. 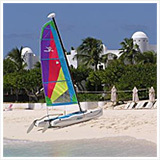 Today, Four Seasons Anguilla's enhancements move it into firm "best of beach" contention. Ambiance, layout and menu have all been taken to new heights. 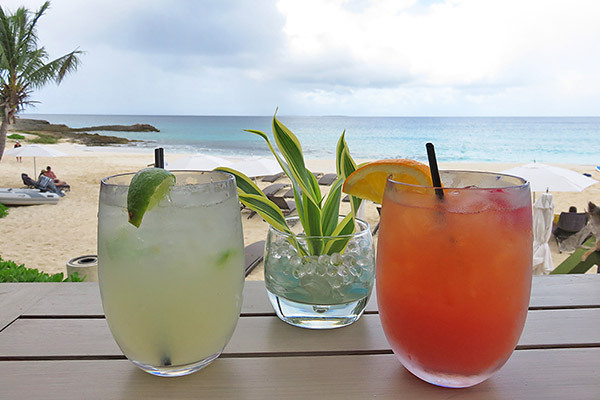 Step inside Four Seasons Anguilla's upscale Caribbean beach bar. 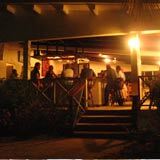 One is immediately struck by Bamboo Bar & Grill's openness to the beach. 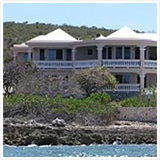 Its spacious terrace expands over the sands of Meads Bay. 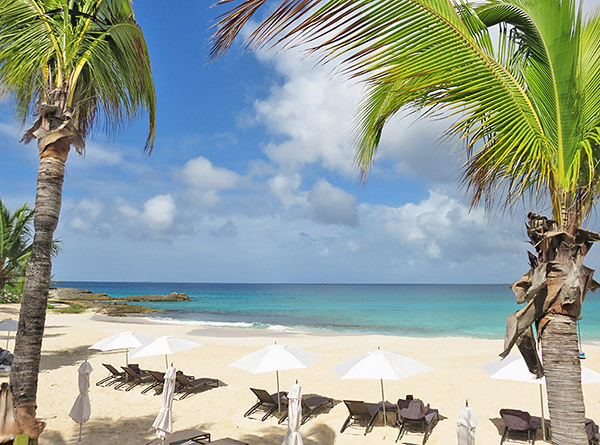 Views stretch down the long sweep of white-sand beach. And what a remarkable and variable view it is! 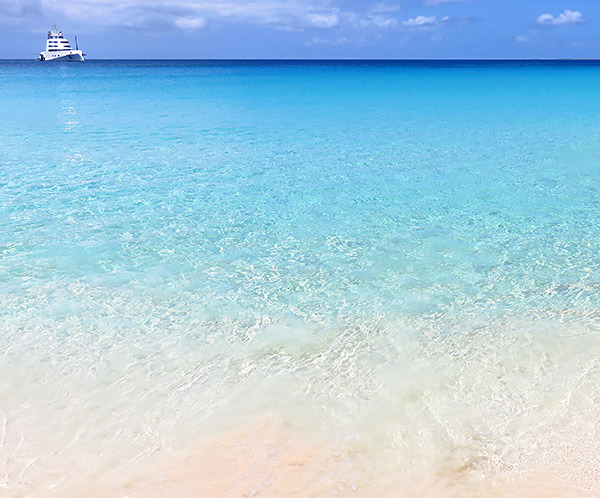 A beach with a jetset buzz, Meads Bay always puts on a show. 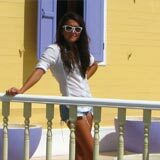 You may find yourself watching some of the world's most famous mega yachts as they in turn watch you. "A", Eclipse and Yalla are all regulars. On another day powerful waves may pound Meads mercilessly. And on the very next day you may find yourself hypnotized by a million points of light shimmering in fifty shades of calm blue water. Meads never fails to wow. 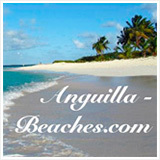 Bamboo's corner of Meads Bay is one of the beach's best. 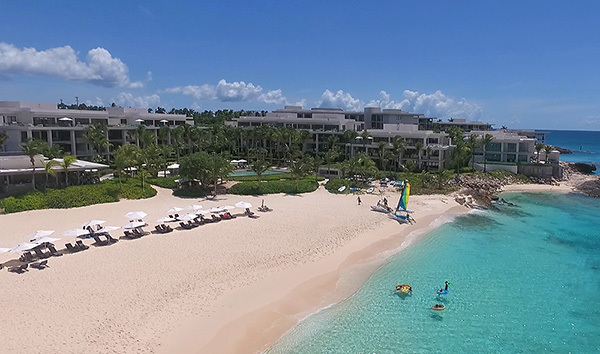 Tucked on the western end, this cove is ripe with excellent snorkeling on calm days. 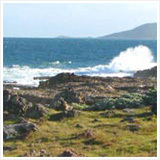 When Mother Nature stirs, it transforms into a surfer's paradise. 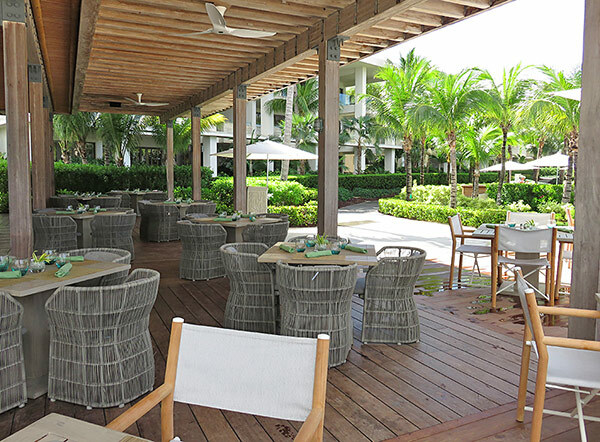 Set back from the outdoor deck is the restaurant's covered dining space and bar, surrounded by swaying palms and manicured gardens. Dressed in woods and lined with bamboo accents, the feeling is markedly tropical. The long, elegant marble bar offsets the use of warm wood. 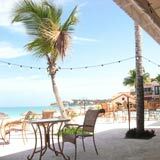 It lends a polished and upscale feel to the beachside eatery. 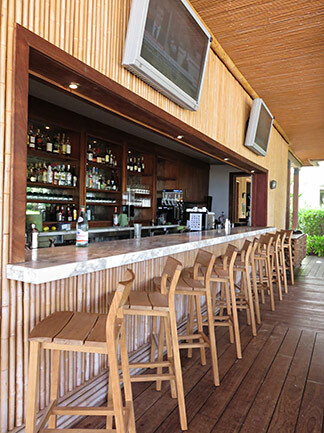 At Bamboo Bar & Grill, the balance of "laid-back" and luxury is well struck. Fancy a couple of hours of sports with drinks and friends? The bar features two flatscreen TVs. The whole covered dining space opens onto the open air deck. 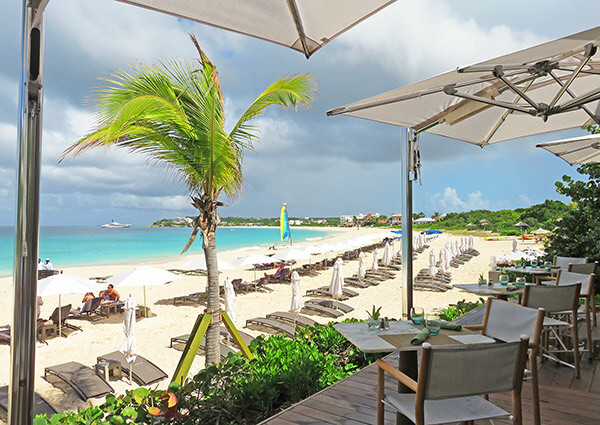 Out on the terrace, crisp white umbrellas provide shade while you take a "front row seat" on Meads Bay beach. 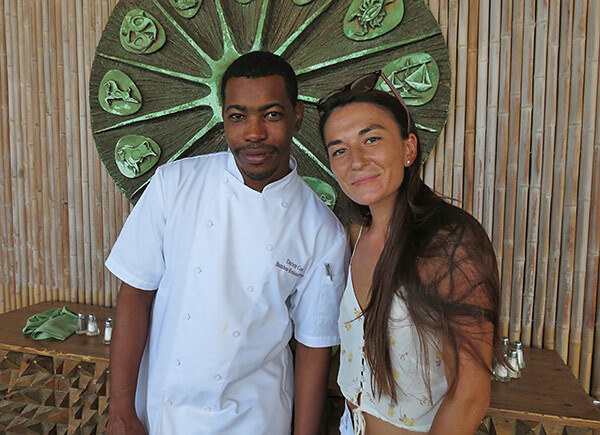 Chef Darren Connor is a respected name in Anguilla. Famous for his many gold medal wins at Miami's prestigious culinary competition, Taste of the Caribbean, he is the island's true, homegrown "MVP." It is no surprise to see this man of many accolades join Four Seasons. 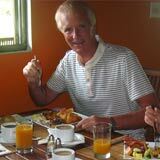 Today, he heads up the culinary team at the widely-loved Bamboo Bar & Grill. A man with experience, skill and a whole lot of passion, your taste buds are in for a treat with Chef Darren. 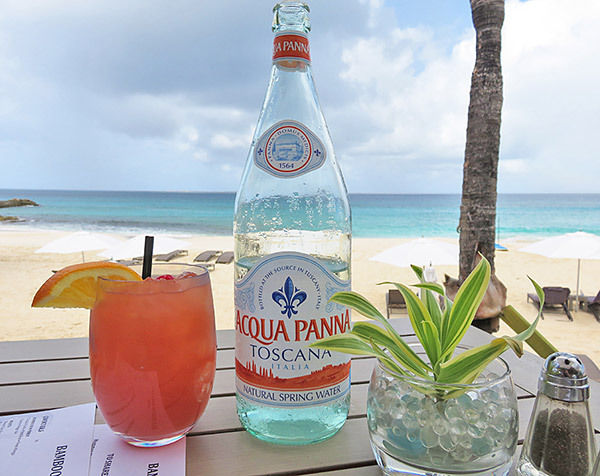 Long, leisurely lunches done "Anguilla-style" begin at the cocktail menu. The Jalapeño Margarita is Four Seasons' signature beverage. Fresh jalapeño is diced and added to the tequila-based drink. Sip slowwwwly. Each sip delivers a uniquely special kick. 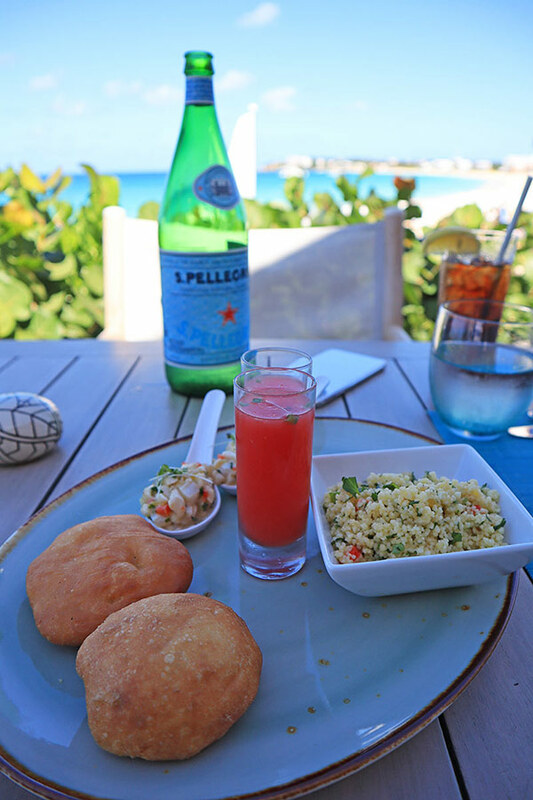 Beach fare is the order of the day at Bamboo. 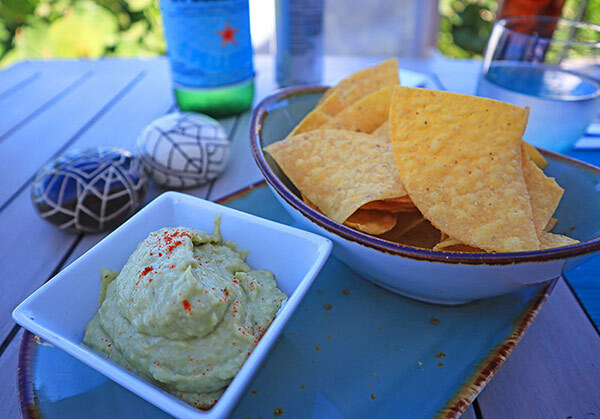 Their lunch menu starts with a selection of "to share" items including the 5 ingredient guacamole and crispy calamari. Dressed in cajun spice and resting on a bed of arugula and lemon, it is extra-addictive. Its special touch? The side of oh-so-divine roasted garlic aioli. 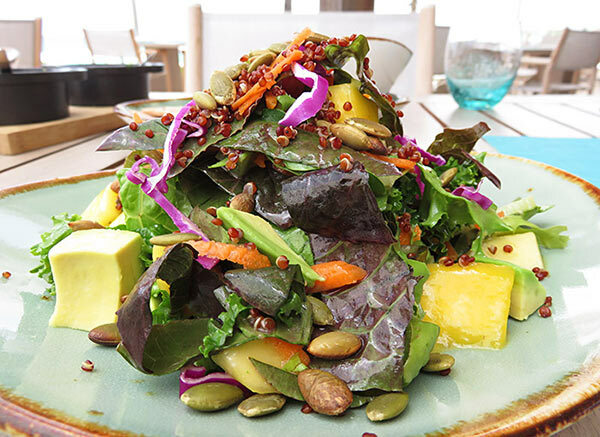 An explosion of healthy ingredients, kale, local greens, moringa, avocado, mango and purple cabbage are all tossed together with a light passionfruit vinaigrette. The salad is peppered with quinoa and pumpkin seeds, which gives the salad a satisfying crunch. 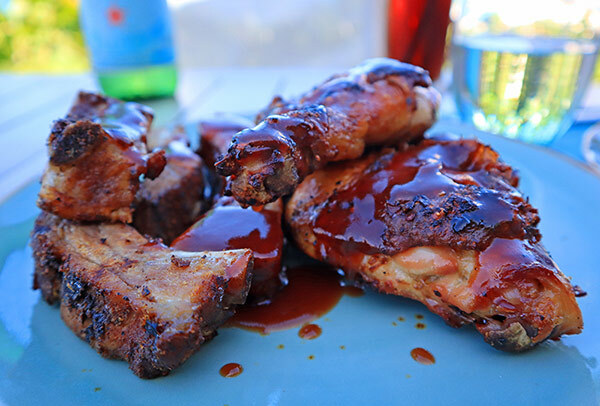 Skirt steak, shrimp, blackened mahi mahi, snapper and jerk chicken breast can be added. There is no compromising on taste, flavor and satisfaction when dining healthy at Bamboo! At this point you are likely to notice that the service is another area that Four Seasons gets right. 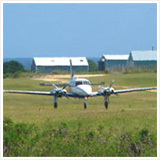 Fast and friendly, they anticipate without hovering. Moving on to the main plates, "The Beach Classics". First up, The Bamboo Burger. 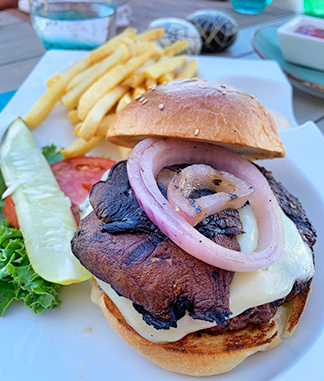 8oz of Kobi Beef is layered with swiss cheese, mushrooms and grilled onions. 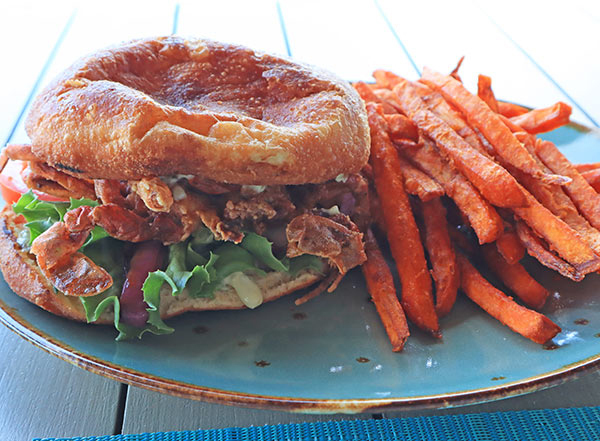 All popped on a picture-perfect bun, the dish comes with a side of fries or salad, and a secret sauce! 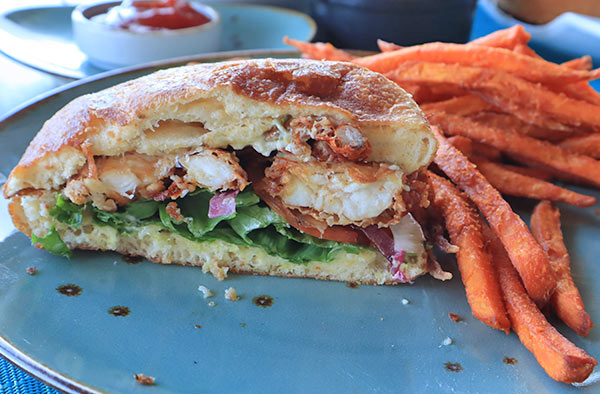 The "Beach Classics" section features many more tasty beach eats, including what just may be Anguilla's top sandwich of all time, The Crispy Crab Sandwich. 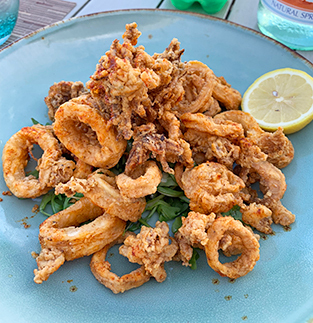 Soft shell crab is deep fried to perfection, layered with red onions and lettuce, popped onto a hot Johnny cake and topped with a tartar sauce. A sandwich with a crispy crunch, we are in love with this Bamboo specialty! The last section of the menu is the "Homemade Pizzas." 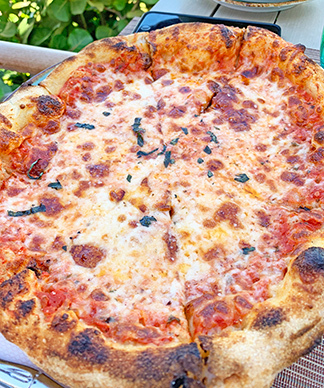 Your options include: Jerk chicken, burrata and baby arugula, quattro formaggi, lobster, classic pepperoni and the margherita. 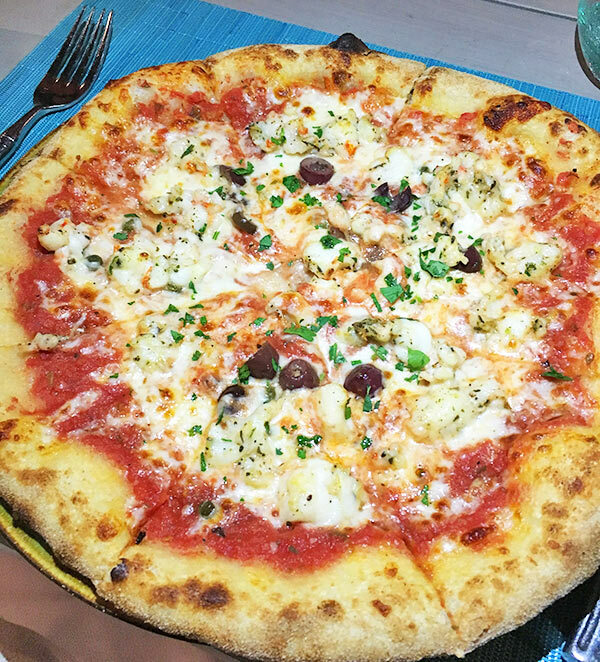 The lobster pizza with capers and olives gets our vote for top pick. A true work of art! Bamboo's dinner menu differs from their lunch menu. 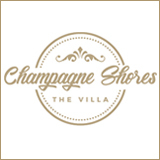 The two menus share select dishes like the starters, homemade pizzas and salads. The dinner menu includes a "Main Events" section with options including the succulent Pepper Crusted Skirt Steak. 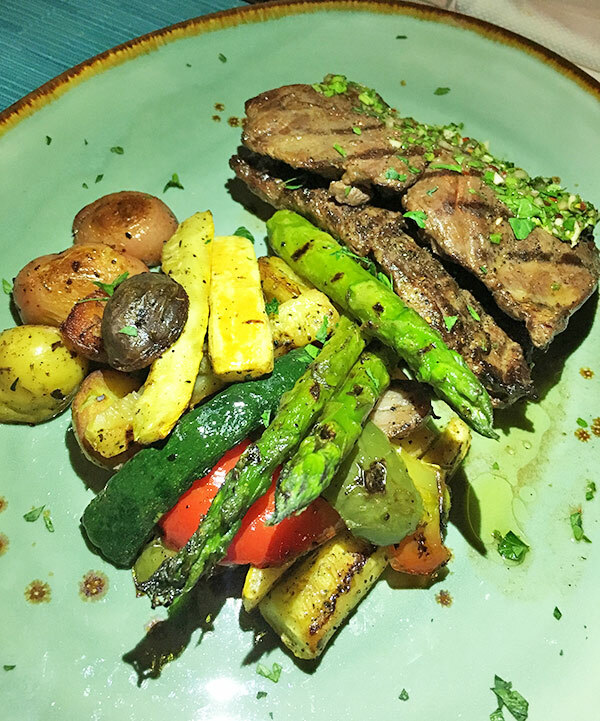 Served with herb roasted rainbow potatoes, grilled vegetables and chimichurri sauce it is a top choice for steak lovers! 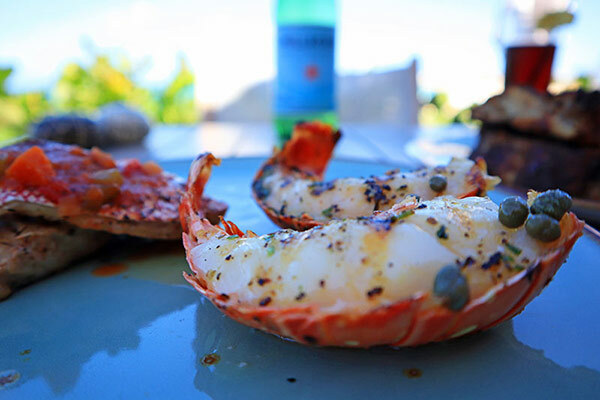 From there, the five-star team serves up a serving of delectable beach BBQ! It comes with all of the trimmings, including coconut rice, plantain and a crisp salad. Last but not least? 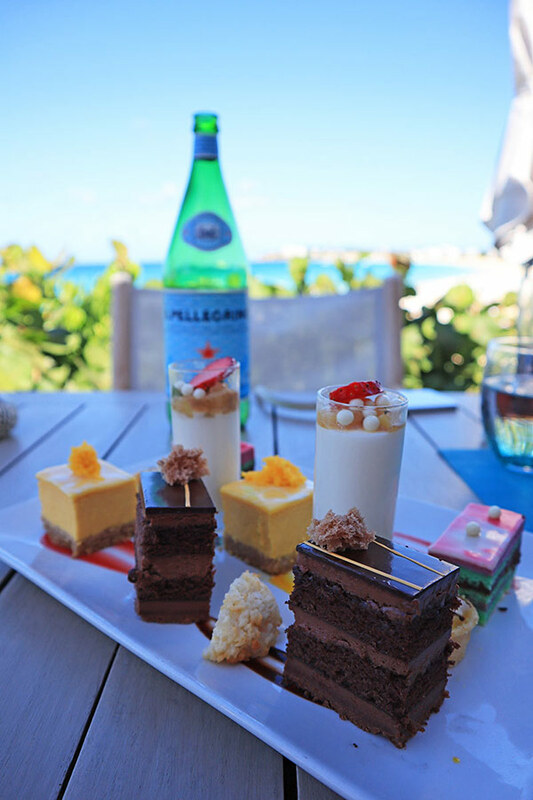 Sunday brunch would not be complete without an array of colorful desserts. Omalie 360 sets a smooth tone (he starts at 1pm), making Sundays 100% fundays at Four Seasons! 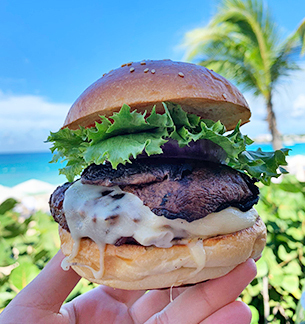 With a vastly improved setting, efficient service and an outstanding menu, Bamboo Bar & Grill is challenging to be your favorite spot on the beach. 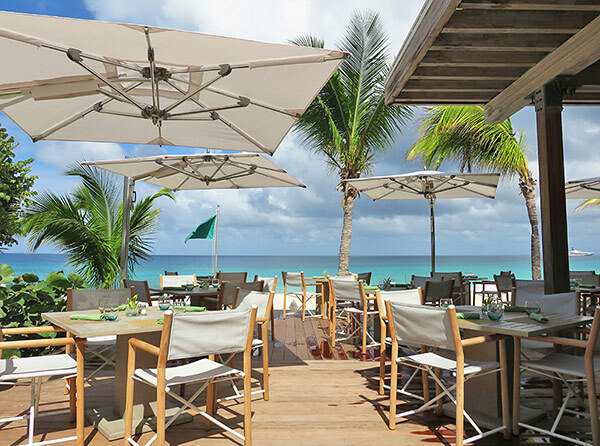 Bamboo Bar & Grill brings a sumptuous beach bite to Meads Bay, living up to Four Seasons' world-class standard. 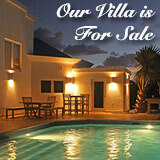 Directions: Located on Meads Bay at Four Seasons Anguilla. Park inside Four Seasons' visitor parking and take the road on the right (away from the main hotel and lobby). 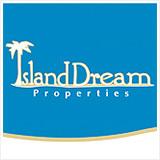 Follow that road and follow the signs to Meads Bay.